Last year the government of China formally adopted the One Belt One Road Initiative to improve the transport and trading links between China and Eurasian and African countries. A modern day version of the Silk Road network of trade routes between East and West circa 207 BCE, One Belt One Road (aka Belt and Road Initiative or just BRI) will be the largest investment initiative in history. BRI will span more than 68 countries and including an estimated $8 trillion of investment in transportation networks, energy production, and telecommunications infrastructure. The majority of the investment will be financed by Chinese-issued debt. 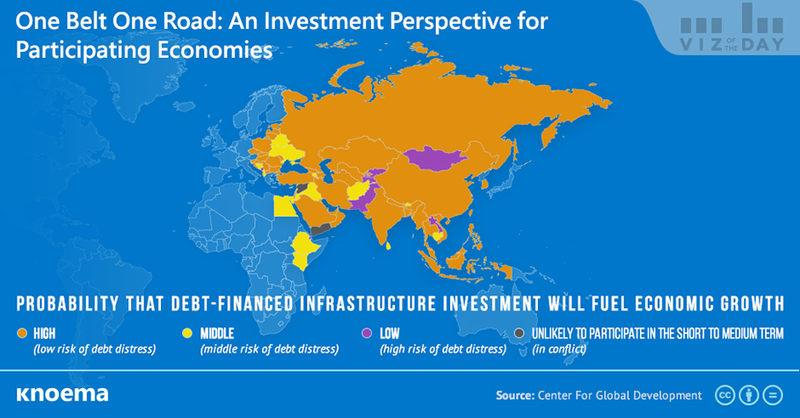 Given the diverse composition of countries, the effects of new debt-financed infrastructure investment will vary. Participating countries range from rich Qatar to poor Afghanistan, high population India to small Timor-Leste, debt-dependent Lebanon to debt-free Brunei, growing Ethiopia to stagnating Yemen, and export-oriented Singapore to mostly import-oriented Bhutan. Large and growing countries for which the value of expected investment is insignificant compared to the economy's size and growth rate—making these countries better able to cope with the additional debt service—stand to benefit the most. Such countries include India, Indonesia, Russia, Singapore, and South Korea. Analysis by the Center for Global Development indicates that none of 68 economies will face systemic debt problems as a result of the BRI. According to the Center, among those countries for which debt sustainability concerns may arise are: Montenegro, Jordan, the Kyrgyz Republic, Djibouti, and Armenia.